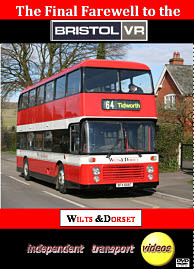 You can go back to 1940 when the original Wilts & Dorset company first ran ECW bodied Bristols. On Saturday 28th March 2009 an end of an era took place when the current Wilts & Dorset said goodbye to the final combination of that body and chassis – the ECW bodied Bristol VR. This also marked the end of everyday service operation of ECW / Bristol buses with a former Tilling Group / N.B.C. operator. The independent transport videos cameras were on hand to record the event for posterity. The day starts at the Wilts & Dorset Castle Street depot in Salisbury where the three VRs for the day are prepared for service. They are Wilts & Dorset liveried 4413 (BFX 666T), Poole Tramways commemorative liveried 4422 (ELJ 214V) and Damory Coaches liveried 5069 (GEL 685V). We then move to the bus station in the city where the first pickups were made, including a photo shoot with the local Salisbury newspaper! Our first service is duplicating route 8 to Amesbury and back with 4413 and 5069. Service 5 is then covered to Pewsey with 4413 and 4422. Following on from here we do Salisbury local service 57 with 4413 and 5069. The afternoon starts with the long run to Tidworth with 4413 and 5069 taking up the duty and the run back to Salisbury Blue Boar Row. For the finale all three VRs run service 44 to Woodfalls Cross, returning to the city as service 43. Our cameras then join 4413 for the final run through the bus station and back to Castle Street depot for the last time. There is plenty of action, with road side footage as well as driver and passenger eye views. The evocative sounds of the Gardner engines are also captured as they are now consigned to history. Duration : 120 minutes (approx).